Amtrak has released a series of computer generated images revealing what the interior of its new Acela Express trains will look like. The high-speed trains are being built by Alstom and are scheduled to enter service on the Boston – New York – Washington D.C. Northeast Corridor (NEC) in 2021. Each trainset will be able to accommodate up to 386 passengers, an increase of up to 30 per cent on the rolling stock they are replacing. They will feature spacious leather seats, integrated in-seat lighting and each seat will be equipped with dual tray tables, providing customers with a large and small table option. 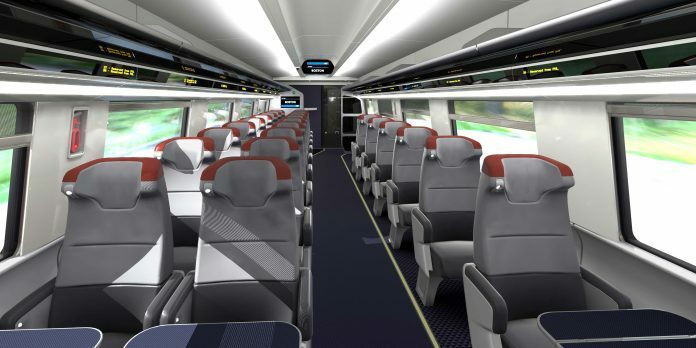 Electrical outlets and USB ports will also feature, as will wi-fi, Americans with Disabilities Act-compliant toilets and each car will have six onboard information screens, providing real-time information such as location, train speed and conductor announcements. Amtrak vice-president of the NEC service Caroline Decker said the next generation of Acela trains will “set a new standard for rail service in the United States” by providing customers with a superior travel experience. Alstom is currently producing a prototype of the new trains at its manufacturing plant in Hornell, New York, which will be ready in 2019. All of the new trainsets are expected to be in service by the end of 2022. Is it a good idea to build trains with seats that don’t have windows and toilets that don’t have windows? And all that white. In some ways the trains being built today are inferior to a British Railways Mk1 carriage of 1951! Consider what happens when your sitting on a seat beside the isle using a Laptop, or having a drink/eating a snack using the table attached to the back of the seat and the person next to you wants to leave the seat for whatever reason. If the person is going to the toilet, or to get a drink/snack, the person will be coming back again, so you have to take everything off the table and leave them on the isle, thereby partially blocking the isle, or gather them up with one`s hands. Then you have to wait until the person comes back again to put everything back again. People and especially Tourists like to look out of the window at the passing scenery. Difficult to do with a pillar blocking, or partially blocking, the view. Wear and tear will show up quite easily against a white background.